What if my child does not want to go to church? What if my child does not want to go to church? Don't take it personal, there are probably days they don't want to go to school or eat green veggies or put on sunscreen. I am sure there are days they don't want to take a bath or go to sleep but you are a good parent so you move them in the direction that is in their best interest. At the Grace Place we work hard to create a worship service that will touch every life…even kids. Our children’s programs are fun, active and instructive. Last Sunday some visiting parents told me their son had so much fun in his class that he asked if he could come back everyday. What a great tribute to his teacher and classmates. For those of you who are parenting teens the Grace Place is a great place for them to make friends, learn about God and find a spiritual mentor. Last weekend as I looked on the stage during worship time I was struck by the fact that the stage was full of gifted, talented worshippers and not one of them was over 22 years old. The vocal team, lead guitar, acoustic guitar, bass guitar, drummer and keyboard player all worked as a team to lead us into God’s presence. We have a great and growing youth program made up of our 6-12th grade students. 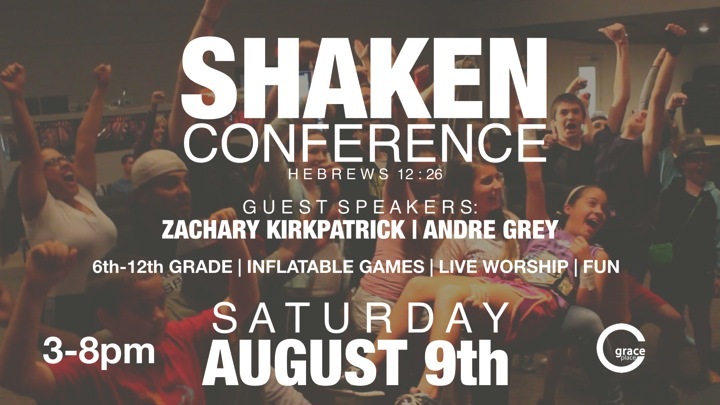 For our parents of teens make sure they get to the upcoming “Shaken” conference on August 9th! It will change their life! So what about the theory that some parents have that says “I should let my children decide on their own if they want religion in their life”. That theory has many holes in it. We would not let our children decide on their own if they wanted clothing in their lives or if they wanted grandparents in their lives or if they wanted food other than candy in their lives. You are a parent because…wait for you it…God wants you to lead your children to do what is best for their lives. Church is so much more than a weekend service. Church is the living, breathing family of God. We can never reproduce the value of a church family on our own. Especially today when so many families are broken through divorce, many have lost the benefit of grandparents, aunts, uncles, cousins extended families. In our church family we get all that back plus. At the Grace Place your kids will find friends, teachers, pastors who will help you instill Biblical values in their lives and you will be able to build a support network. We care about each other. We have so much fun each weekend. Best of all God moves powerfully in our gatherings and lives are changed. The best decision you will ever make for your family is make sure they are at church each weekend.